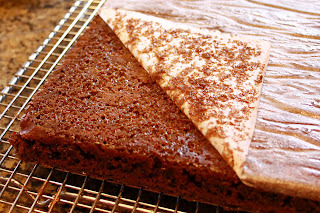 Katie's Favorites: Allergy Friendly Chocolate Cake! I have a child with serious food allergies. Serious as in: there are foods that if she has the tiniest bit, she could die. Others she could tolerate small amounts if ingested, but still have serious reactions, and one that just gives her bellyaches for hours. Do I panic about it? Nope. But she's only 2 and still in my constant care. I am quite careful who I let babysit her and I mostly try to feed her before I leave. Alyssa also has some cousins and friends with food allergies, so luckily I was already familiar with how to handle food allergies before she came along. This recipe comes from Brad's sister, Heidi. She was the food allergy pioneer in Brad's family. I'm thrilled to report her boy has mostly outgrown his allergies, so it gives us hope. Back to the cake--it's really very delicious--so delicious I make it most of the time instead of regular chocolate cake. It makes 2 dozen cupcakes, or one 9x13. For Natalie's birthday, I did 12 cupcakes and a 1/4 sheet pan cake from one batch. 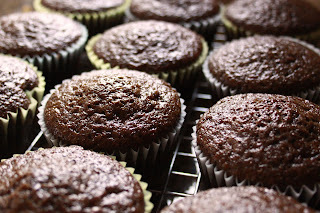 So if you know a kid with food allergies, and I'm guessing you do, share this recipe. And if you don't have food allergies, share this recipe because it's just that good! It's egg-free, milk-free, soy-free, and nut free. Mix dry ingredients together. In a separate bowl, combine wet ingredients. Beat together until cake mix consistency. Bake in a greased and floured pan at 375 for 25-30 minutes. I love to make layered cakes. The easiest way to get them out of the pan is to use parchment paper. Cut a piece of parchment (I usually trace the bottom of the pan onto the paper) and place it in the bottom of your pan. 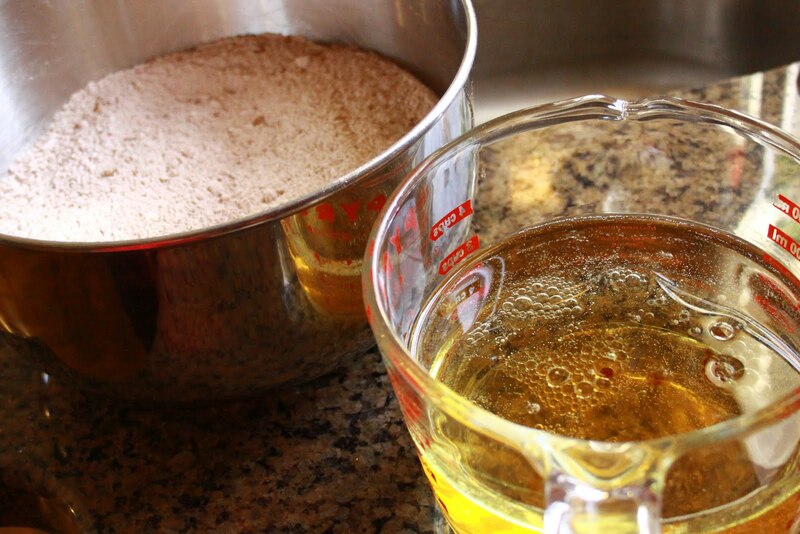 Give a light spray of cooking oil, then pour in batter. 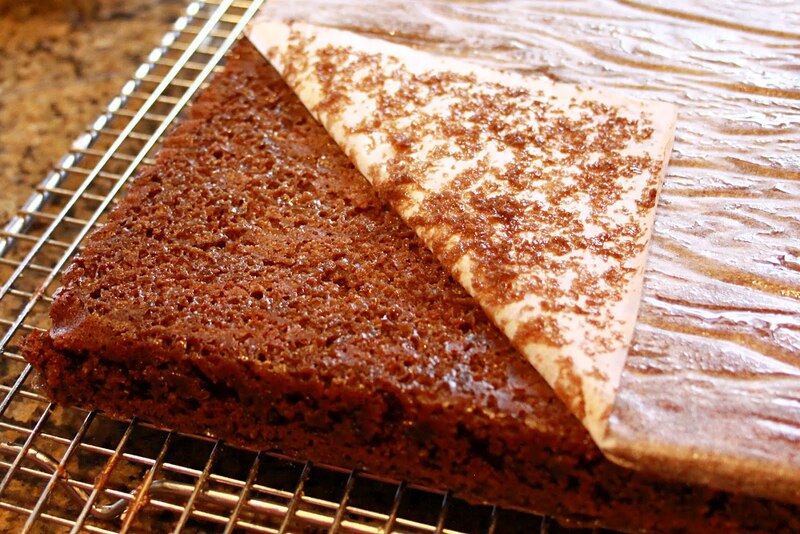 When you turn over the cake to remove from the pan, it's easy as can be. Then just peel off the parchment. You have a kid with allergies too? Man it really does run in the family doesn't it. You girls (Krick and you) are superwomen to handle the food allergies. I couldn't do it.